x360 Journal: Completion Shirts now on offer! Completion Shirts now on offer! 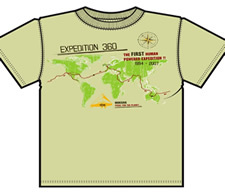 A selection of commemorative shirts to celebrate the completion of Expedition 360 are now available through the website. The design marks the final route around the world from Greenwich, through the two antipodal points on the Atlantic and western Australia, and back to Greenwich again. You can choose from three styles: a hoody, long-sleeve sweat or just a short-sleeve t-shirt. A range of different colours are also available. 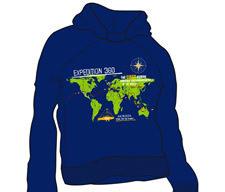 This is the last in a total of seven designs that were printed over the years to raise funds to keep the expedition going in the absence of formal sponsorship. 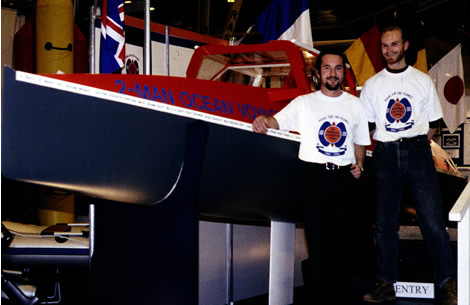 The original, as seen here worn by Steve and I at the Earl's Court Boat Show in January 1994, is printed with the hopelessly optimistic dates of 1994-1996! This final design gives the real tally of 13-years. Visit the store on the expedition website to find out more. Please note that only 200 pieces have been printed as a limited edition series. Order now while they're available!